VANCOUVER — Don’t confuse Interjet with a low-cost carrier, says the airline’s chief commercial officer Julio Gamero who was at Vancouver International Airport (YVR) in Richmond as the airline’s first West Coast flight landed in B.C. “We are a value-carrier,” he said, adding the airline is known for offering quality service at the best price. “We don’t charge you for your tequila onboard,” he said, adding that the airline offers more legroom, a 50-kilogram limit on baggage, free beverages (alcohol and non-alcohol) plus snacks and permanent senior discounts. Interjet launched year-round, non-stop scheduled service on Oct. 26 between YVR and the dual destinations of Mexico City (the airline’s head office and hub) and Cancun. The airline jumps into the B.C. market with return fares starting at $519. 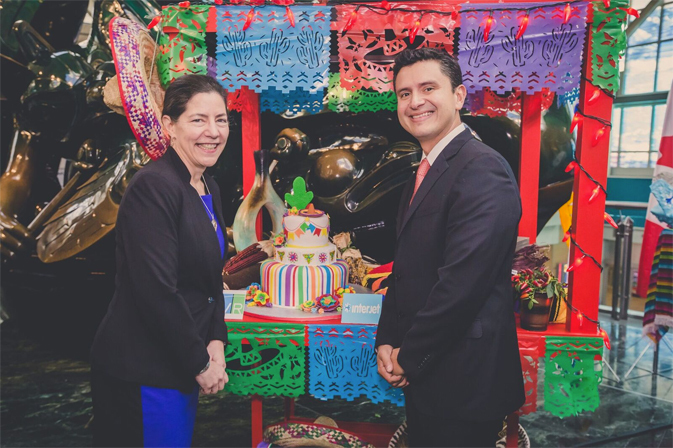 At the airport, the first flight brought out dignitaries, a mariachi band and ribbon cutting in a festive atmosphere to celebrate the Mexican carrier’s arrival. Interjet is positioning itself to take advantage of a growing Mexican market that competitor WestJet has been touting. It squeaked into the YVR hub only five months ahead of WestJet, which announced on Oct. 3 that it was adding nonstop, year-round flights starting in March 2018 from both Calgary and Vancouver to Mexico City. Starting March 14, WestJet will begin service with four weekly flights between Calgary and Mexico City. On March 15, WestJet will launch three-time weekly service between Vancouver and Mexico City. Effective April 29, both routes move to daily service. For Interjet, the opening of the Vancouver gate is the final plank this year in entering and structuring the Canadian market, a strategy that has been a “dream” for the airline, said Gamero. Earlier this summer, Interject launched service out of Montreal and Toronto into Mexico City and Cancun. “The whole idea was to strengthen our presence in Canada,” he said. The airline’s focus now will be to build traffic volumes out of the three Canadian gateways and then add more destinations as numbers increase. He said the Mexico City destination serves as a hub for connections to other points throughout Mexico and into South America. Interjet is interested in working with travel agents, Gamero said, and pays a 4% commission on sked bookings. The airline also has vacation packages that are commissionable and can help arrange ground excursions. With the new service, agents can now book multi-destination travel in Mexico without any time constraints on ticketing as would happen with charter packages. Gamero said that is also possible to open-jaw on the two destinations offered out of Vancouver for those who want to visit Mexico’s major city and Cancun, a sunspot. Interjet offers service between the two points. L-R: Berenice Diaz Ceballos, consulate general of Mexico; Julio Gamero, chief commercial officer for Interjet; Anne Murray, vice-president of marketing and communications for YVR; and Ty Speer, president and CEO of Tourism Vancouver. Flights to Cancun out of Vancouver, via a 150-seat Airbus A320, will depart four times a week leaving at 5:50 a.m. and arriving at 3:05 p.m. on Monday, Thursday, Friday and Sunday. Flights leaving Vancouver for Mexico City will depart at 9:30 p.m. and arrive at 5:15 a.m. on Monday, Thursday, Friday and Sunday. Flights back to Vancouver return on the same days. 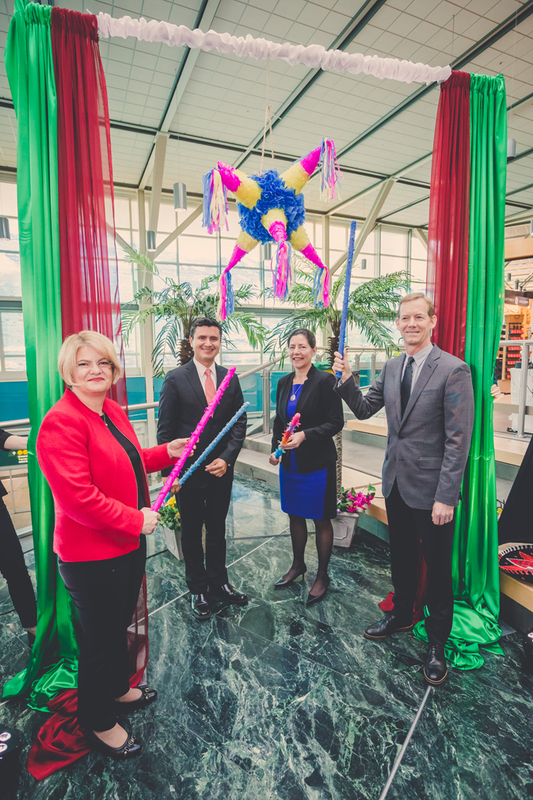 Anne Murray, vice-president of marketing and communications at YVR, was on hand during the greeting ceremony at YVR and said the new carrier extended the airport’s ability to connect the Asian traveller coming to YVR with all points in the Americas, including South America. Interjet out of Mexico City flies to Central America destinations such as San Jose, Costa Rica; Bogota, Colombia; Guatemala City, Guatemala, and Lima, Peru, said Gamero. Murray said the new service will contribute $16.3 million to the economy as visitors to B.C. use local hotels and explore the province and create 100 new jobs. She applauded the federal government’s lifting of a visa requirement for Mexican visitors to Canada last year. 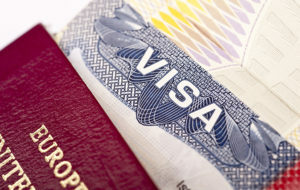 Berenice Diaz Ceballos, Consulate General of Mexico, noted that since the removal of the requirement, there is already a noted rise in the numbers of Mexican travellers coming to Canada for business and leisure. Interjet has also been strengthening its position on the U.S. Western seaboard as it recently announced service out of Los Angeles. The airline is adding a new nonstop service between Los Angeles and Los Cabos, Puerto Vallarta and El Bajio beginning Nov. 23. The airline already has nonstop service to Cancun, Mexico City and Guadalajara out of Los Angeles. The new service gives flexibility to Canadian travel agents who are booking clients on a two-destination vacation (such as Disneyland) and then linking up with Interjet in Los Angeles, visiting Cancun or Mexico City and then flying directly back to Vancouver.